When Maserati first announced they’d be building a crossover in 2011, they named it the Kubang – not exactly a name you’d want to associate with a small-ish Italian car company – but the styling was promising and many of those lines have carried over into what we see today in the Levante. While a crossover is all-new to the brand, Maserati carried over the drivetrain and much of the interior design from the Ghibli, which is no bad thing in our book. To be honest, in its normal and sport suspension settings it doesn’t take much squinting to convince yourself that the Levante could be a Ghibli hatchback. Inside, however, the Levante has a light, airy feeling with plenty of headroom between you and the large panoramic sunroof. Behind the rear seats, storage is generous, with a low floor that makes loading and unloading heavy items a breeze. 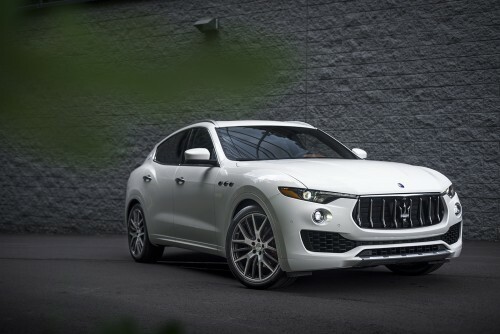 The Levante comes in two flavors: base and S. Both versions come standard with Maserati’s Q4 torque-vectoring all-wheel drive system, with the biggest difference being power output from the Ferrari-built 3.0-liter, twin-turbo V6. While the base model you see here has 345 horsepower on tap, the S model puts down a whopping 424 hp which is good for a brisk 5.1-second 0-60 MPH run, while the base model Levante will take about 5.8 seconds. In the case of the 345-hp Levante, power feels more than sufficient, without any discernable turbo lag or hesitation. That being said, we’re sure the additional 79 hp from the S model would increase the fun factor a little bit. The 8-speed ZF automatic transmission feels a bit lazy in Normal and I.C.E (Increased Control & Efficiency) modes, but pressing the Sport button – once to speed up engine and transmission response times, twice to firm up the suspension – give you the full Maserati experience. For the most enjoyable experience for the driver, we recommend Sport 1 (leaving the suspension in its softer setting) and Manual mode for the transmission, allowing you to shift for yourself using the delightful, clickity-clack aluminum paddle shifters. The adjustable air suspension also has an option for two off-road modes that raises the suspension a bit. While the tallest setting is only available below 30 MPH, we found the raised suspension to be compliant and well controlled, without any of the expected body roll. In its normal suspension setting, the air springs will automatically lower the vehicle at highway speeds to improve aerodynamics, or drop the Levante to its lowest setting when parked to aide the entry and exit process. In Sport mode the suspension tightens up, reducing body roll but also transmitting more lumps and bumps from the road through the steering wheel. Sport 2 is the Levante’s most aggressive setting (the engine and transmission are more responsive and the suspension is at its lowest and firmest) but it still doesn’t beat you up on anything but the harshest broken pavement. Regardless of the suspension setting, there’s a feeling of control that is always communicated through the wheel. The Levante always feels planted and stable, whether hammering down the highway, powering through corners, or even traversing a rough dirt road. No matter what sort of driving you’re doing, the interior of the Levante is just as serene and beautifully tailored as you’d expect it to be. The beautiful Cuoio natural leather that lines the seats, doors, and dash, comes from the same source Ferrari uses for their interiors. Thanks to the use of laminated glass for most of the cabin, the interior of the Levante is whisper quiet, allowing only a hint of engine growl from the powerful V6 lurking under the hood to make its way to the driver. If you want to make some noise in the cabin, it’s recommended that you consider the 14-speaker, 900-watt Harmon Kardon or 17-speaker, 1,280-watt Bowers & Wilkins audio systems. The standard system isn’t bad by any means, but there is a bit of room for improvement in terms of overall clarity and bass. The 8.4-inch Maserati Touch Control infotainment system is responsive and easy to use and it integrates both Apple CarPlay and Android Auto as standard. A surprising amount of safety features are available on the Levante such as adaptive cruise control with stop and go, forward collision warning, lane departure warning, and surround view camera system as part of the $3,000 Driver Assistance Plus Package. Showing the dual personalities of the Levante, however, are standard features like hill descent control and a mechanical limited slip differential with torque vectoring. Of course, with a $73,300 base price for the Levante that grows to $84,600 for the S model, this shouldn’t be just another generic, vaguely sporty crossover. While other vehicles in this segment are built on the bones of far more pedestrian siblings, the underpinnings of the Levante are shared only with other Maseratis. When the bean counters suggested outsourcing certain components to save costs, the engineers raided the parts bins at a factory across town known for winning the most Formula 1 trophies in history. They consulted one of Italy’s most prominent design houses for inspiration and materials for the interior. They hired the world’s leading premium audio company for acoustic tuning. Maserati didn’t just build a crossover with the Levante. They built the best vehicle they knew how to build. Print article This entry was posted by Alex Bellus on July 19, 2017 at 2:19 pm, and is filed under Blog, Just Landed Cars, Maserati News. Follow any responses to this post through RSS 2.0. You can leave a response or trackback from your own site.